Adjustable gastric banding is one of the three major bariatric surgeries that currently enjoy popularity and acceptance among obese people. The other two are a gastric sleeve and gastric bypass surgeries. The use of adjustable gastric banding evolved from the non-adjustable band by Wilkinson and other surgeons in 1970s. The non-adjustable band was however associated with series of complications that necessitated reoperation or complete removal of the band. These complications include vomiting, band erosion or displacement, esophagitis and Barrett’s esophagus. Szinicz et al. in the mid-1980s placed silicone bands in animals. They referred to this procedure as “reversible gastric banding.” Another surgeon Lubomyr Kuzmak in 1986 reported the placement of adjustable silicone gastric bands in humans and also demonstrated its superiority over the non-adjustable band. With the advent of laparoscopic surgery, the laparoscopic adjustable gastric band was placed in a human in Belgium by Belachew et al. in 1993.1 The laparoscopic approach significantly reduced the perioperative morbidity and mortality and also hastened recovery. Considering Lap-Band or Realize Band? Learn why our bariatric surgeons no longer recommending these bariatric surgeries, and why they are supporting the Gastric Sleeve Surgery Mexico instead. Gastric banding has an advantage of preserving the anatomy of the gastrointestinal tract. The stomach is not resected as in gastric sleeve, and the intestine is not refashioned as in gastric bypass and duodenal switch surgeries. Therefore, complications due such alterations are not seen in gastric banding. The procedure is also reversible. In the United States, both Lap-Band and Realize Band enjoy FDA approval. 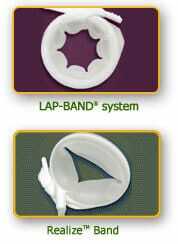 The LAP-BAND got FDA approval in 2001 while the REALIZE Band got approval in 2007. These devices induce weight loss by the restrictive mechanism. They reduce the stomach capacity by dividing it into upper and lower compartments. The top pouch is smaller and receives the food from the esophagus. Once it fills up the individual begins to experience the sensation of fullness and stop eating. After partial digestion, the food is gradually released into the lower stomach pouch for subsequent movement into the small intestine. Laparoscopic approach places both. Once the band is implanted, they are inflated with sterile water. The amount of water used for inflation of the band can be increased or reduced in both types of groups. However, the settings differ. The duration of surgery is similar in both. No difference in cost between REALIZE Band and Lap-Band. The average price in the United States is $18,000 ($15,000-$24,000), and insurance covers both. Origin: while the Lap-Band was developed in Belgium, REALIZE Band originated from Sweden. Company: Lap-Band is made by Allergan while REALIZE Band is from Ethicon US (Johnson & Johnson Company). Versions: in the U.S. the Lap-Band has three versions while the REALIZE Band has just two releases. The Lap-Band versions are the 2001 version (9.75/10 Lap-Band System), the 2004 version (Lap-Band VG System) and the 2007 version (Lap-Band AP System). 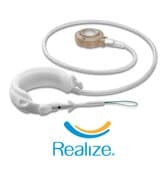 Size: the REALIZE Band comes in one format that can be used for anybody while the Lap-Band comes in 2 different sizes (AP standard and AP large). Lap-Band and REALIZE Band. The average is about 40-50% of the excess weight. Different studies have also shown similar effects on comorbid conditions such as hypertension and diabetes. Snyder B, Wilson T, Mehta S, et al. Past, present, and future: Critical analysis of the use of gastric bands in obese patients. Diabetes, metabolic syndrome and obesity : targets and therapy. 2010;3:55-65. Contact our effective patient educators who can help guide you through the entire process of getting approved for the Bariatric Surgery in Mexico.